In 1991 the Wessex Pictures Commercial Framing School was awarded a National Training Award by the Department of Trade and Industry in the presence of the Patron, His Royal Highness The Prince of Wales. The award is in recognition of quality, content, high standards and the professional manner in which the courses are run. Consideration is also given to the success achieved in our industry by previous students and their high recommendation.. The Wessex Pictures Commercial Framing School runs a series of professional courses in our Leatherhead branch training either those who wish to set up their own framing business, framing staff for existing workshops or professional framers wishing to expand their business by learning new skills. Our classrooms are equipped with a variety of machines to familiarise students at different levels and to help prospective buyers decide which models best suit their needs. 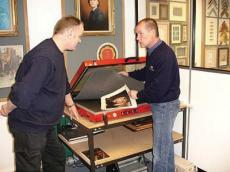 Each course is run by a team of professional framers which include Garry White GCF, David Wilkie GCF and Steve Goodall. All courses run from 9.30 am - 5.00pm Monday to Friday with refreshments provided and an hour break for lunch which is provided free. Places are limited to 6 students, We require a £175 deposit to reserve a place. The balance is due three weeks before the course. In the event of a cancellation the deposit is refunded if three weeks notice is given in writing. Each student completing the five day course is awarded a certificate of attendance. by attending this course for newcomers to framing or for upgrading established framers. This course has been running successfully since 1987 and has helped many framers get started. The curriculum has been tailored to suit newcomers to the framing industry as well as established framers wishing to train their staff or update on modern equipment and learn latest techniques. All aspects of picture framing are covered, from bespoke to contract framing. Ample instruction and practice at each stage. Students bring a print up to 20in. x 16in to take away as a completed job. Mon am: Lecture on Mounting and Lamination. Demonstration and practice of drymounting. Mon pm: Lecture on Heatsealing, Canvas Bonding and Stretching. Practice of Heatsealing and Canvas Bonding. Tues am: Lecture on Mount Cutting. Practice of straight mount cutting. Double mounts & V-grooving. Uneven borders and title windows. Tues pm: Lecture on Oval Mount Cutting . Practice of oval mount and glass cutting. Circles and combination cutting. Wed am: Lecture on Mount Decoration . Use of corner gauge, drawing lines, applying a wash and other decoration. Wed pm: Lecture on linking moulding to mount colour. Producing a mount for your finished picture. Demo on staining plain wood moulding. Thurs am: Lecture on Mitre Cutting. Choice of moulding and measuring techniques. Practice of mitre cutting. Thurs pm: Lecture on Underpinning. Practice of mitre cutting and underpinning. Fri am: Lecture on Glass Cutting and final picture assembly. Practice of glass cutting and assembly. Fri pm: Lecture on pricing, marketing, advertising and business management. WESSEX PICTURES have a complete range of picture framing machinery, materials, accessories and mouldings available from their five regional branches. A complete range of machines in stock, from hand operated tools for home or craft framing, right up to mass production equipment for photo-frame or mirror manufacturers. As picture framers ourselves, WESSEX PICTURES can evaluate machinery before adding it to their range and can give advice based on real experience when recommending a machine. It is in our interest to help customers succeed and hope they will continue using WESSEX PICTURES as a supplier. If you don't already have a copy of our catalogue, please ask.